This modern coffee table features a built-in fridge, Bluetooth, power outlets, and a handful of other useful features. When it comes to furniture today, aside from aesthetics and general style, not much has changed over the past few decades. In the modern connected era, doesn’t it make sense to have a coffee table which is more than a place for your remote? 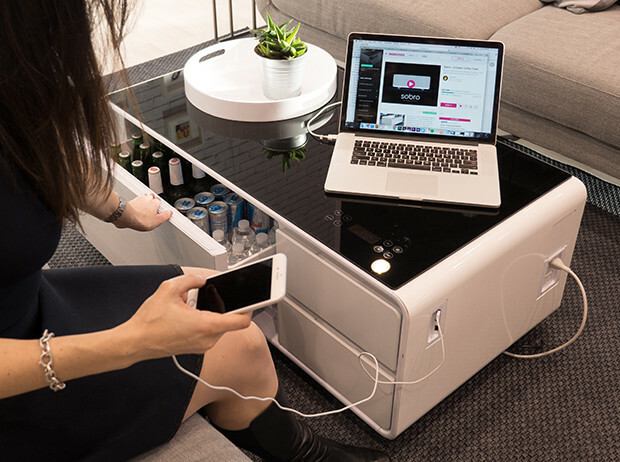 Sobro is an enhanced coffee table designed with a refrigerator, Bluetooth speakers, charging ports, and LED lights. It also features a tempered glass top and connects to the user’s TV via Bluetooth. There’s also a touch control interface which enables users to control Bluetooth, audio, lights, and drawer temperature right from the tabletop. There are no additional apps to download or smartphones required. Sobro isn’t the companies first foray into the crowdfunding space. In 2016 they shipped the PancakeBot to over 72 countries across the globe. That device is the world’s first DIY pancake printer. The controls also are stored safely under the tempered glass, so there’s no need to worry about spilling liquids on the display and buttons. To use the device, users only have to plug the Sobro into a wall outlet, and they’re ready to go. There’s no assembly required aside from screwing on the legs of the table and plugging it in. With the included cord concealer users can smooth the cable on the floor and keep it out of the way. Sobro is sized at 17.5” x 43” x 23”, the speakers have a 90dB sensitivity (2.83 V/1m), power handling 15W RMS 10%, impedance nominal 8 ohm. The Bluetooth sensors have a range of 33 feet, and there are eight different LED color schemes for users to choose. As far as circuitry goes, Sobro supports any standard outlet type device with a power rating of 200w total (or 100w per outlet) – this is ideal for laptop chargers, battery chargers, and some projectors. At the moment there’s only support for the US and Canada. Safety wise, the makers are looking into adding an overload safety switch to the device. So far the makers of Sobro have raised over $500,000 via crowdfunding with an estimated shipping date of September 2017. Early bird pricing for the device starts at $629 which $870 off the MSRP. While shipping costs have yet to be fully determined, the makers of Sobro are capping the cost at $89. The device is currently only available in white; however, if the company reaches their $1 million stretch goal they’ll also offer Sobro in wood and black designs. As I was reading the article I was trying to think of different names for this thing. I just feel like there is another, a better option for this type of furniture out there. I am not having any luck, however, sort of a creative block I suppose. Other than the overload safety switch, I would say the inventors have nailed this pretty easily. The early bird pricing is the only way this thing would be affordable and make sense to me. Paying more than $1,000 otherwise, just is not practical for most applications. Even though, having a fridge in my coffee table is the next best wish I have, it’s just too much money. I love this thing! when I was back in college I would have had 2 of these in the same apartment. What a great idea for a space-saving piece of furniture that makes sense. When it comes to having something that is small and dual purpose for an apartment, right now, I cannot think of a better product. Wouldn’t this be a splendid idea for a wedding or house-warming gift…not a bad addition to a dorm, either! I think that with a price tag like this they are going to sell like hot cakes. Especially when you cap the shipping costs. For that cost, as an early bird, that might not be a bad addition to the home. I really like the look of the thing! O M G! I barely had to read the article before I realized the need for one of these. What a great idea, especially for a small space for entertaining! LOVE IT!